This is part of our Investment Risk Management series. A core part of our mission is to help our clients pursue their targeted returns with the least risk possible. This series will examine proactive strategies you can employ not only to reduce investment risk but also to pursue market opportunities. Bonds are inching out of a 35-year bull run. That means most investors today have never invested in a continuous rising-rate environment. It's now critical to understand how rising rates might affect your portfolio—both stocks and bonds. Investors who typically use bonds to either 1) generate income for living expenses or 2) reduce portfolio risk must change their strategies. This is especially true for risk-adverse investors who shifted to bonds after 2008 and haven't adjusted their portfolio since. 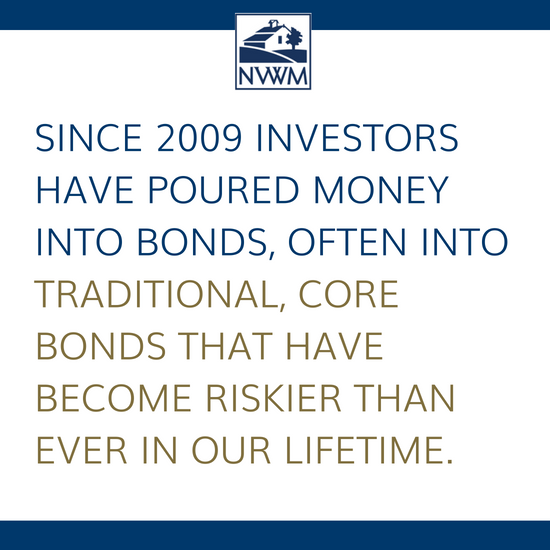 Core, traditional bonds (high quality, CDs, long-term corporate, long-term Treasurys, long-term muni bonds) are now riskier than they ever have been in our lifetimes. Unfortunately, these are also what the vast majority of investors hold in their portfolios. 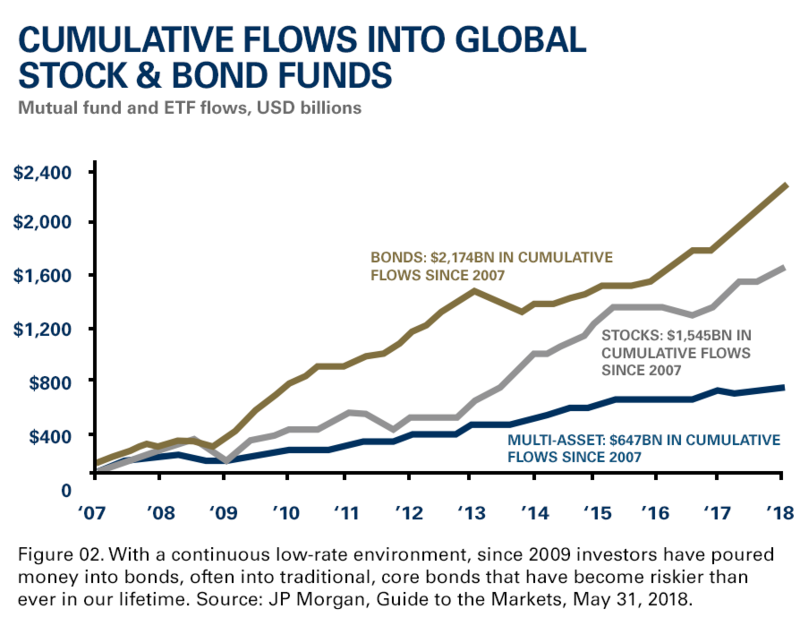 With a continuous low-rate environment, investors have poured money into bonds—more than $2 billion since 2007—and they continue to do so. Many have purchased these funds based upon past performance, which, of course, has appeared strong due to the decades-long bull market. But a dangerous— and understated—risk has been lurking. Most investors don’t see or “feel” the risk. Their income has remained intact and, until recently, their fund values did not decline—in fact, they increased. So, where's the risk? With interest rates hovering near historic lows, traditional-bond prices have been at all-time highs, while their income has been at all-time lows. Therefore, investors trying to generate the same income they did 10 years ago must put much more money into relatively-expensive bonds. 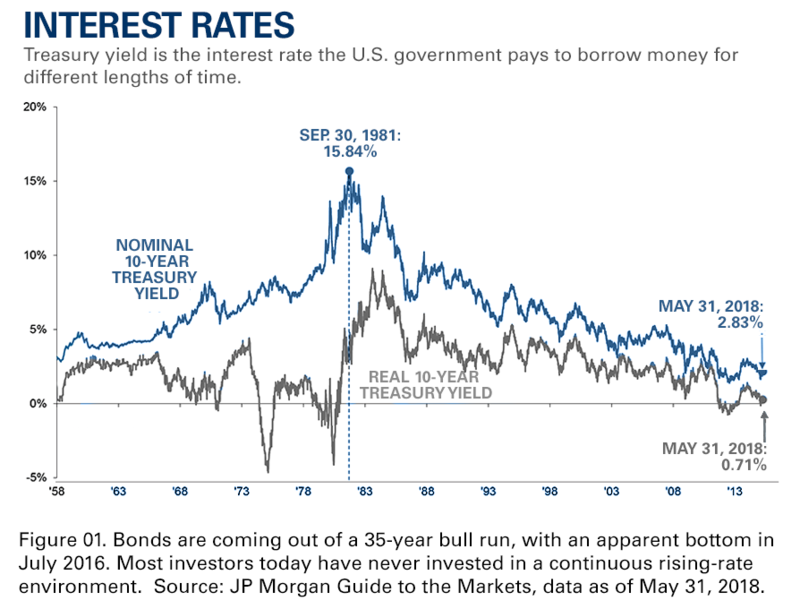 While interest rates have fallen for 35+ years, investors have been putting money into increasingly riskier bond investments to generate the same income, unaware of the underlying issue. Unfortunately, as rates start to increase, these bonds are most rate sensitive, and their values will quickly decrease. As we'll see below, for every 1% increase in interest rates, traditional bonds such as 30-year Treasurys drop by 17%. This principal value is gone forever, barring another run of decreasing rates, which is highly unlikely. Statistically, a period like we've been in is always followed by underperformance. Should You Avoid Bonds Altogether? With all the risk, should you dump your bonds and avoid them altogether? Eliminating all bonds is surely an option and one that we hear often; however, a personal wholesale sell-off is not a strategic, or a prudent, choice. In the current rate environment, eliminating all fixed income would lead us to two alternatives: 1) invest in cash and earn just over 0% or 2) increase equity investments, which are valued relatively high. This would skew portfolios to over-allocation, and would significantly increase overall investment risk. It appears more prudent to look for bonds that may perform well during a rising-rate environment. Which might those be? The answer lies in understanding how different bond classes react to a change in rates. Some bond classes are highly rate sensitive; others, not so much. You can see in the graph below that traditional bonds, such as 30-year Treasurys, decline in great measure when rates increase. With every 1% increase in rates, they can lose 17% of their principal. Conversely, bonds such as floating-rate funds barely sneeze at rising rates: They might lose only 0.1% for every point climb. The first key, then, is to understand how quickly rates will rise. You obviously don't want to be holding a bag full of 30-year Treasurys if rates are launching like a rocket. Given the Fed's language and cautious moves thus far, we expect our slow rising-rate environment to continue for the near future. The second key is to diversify in bond asset classes that 1) are less sensitive to rate increases and 2) generate income to offset any value losses. Though we've been in three decades of falling rates, peppered throughout are several small periods of rate increases, notably 1988-89, 1994-95, 1999-2000, and 2004-06. Analyzing these smaller intervals may provide a hint as to how bonds might perform in this new environment. Short-term bonds don’t typically experience significant decline during periods of rising rates (anomaly of 2008 with credit issues). From 1988 to 2016, there were 17 time periods in which short-duration bonds decreased in value more than 1%, but they only dipped more than 2% nine of those times1. The worst return-period was 2008 when they declined 7.5%. Therefore, based upon history, we could forecast that short-duration bonds likely return near breakeven in a rising-rate environment, declining by 1-2% in value. This loss would be offset in six months to three years by generating income. 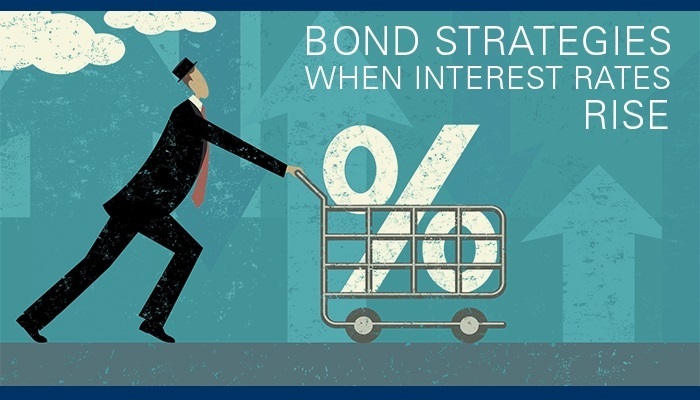 Short-term bonds can be a safer alternative than longer-term bonds, such as a typical 10-year Treasury, which could decline nearly 9% with every 1% rate hike. 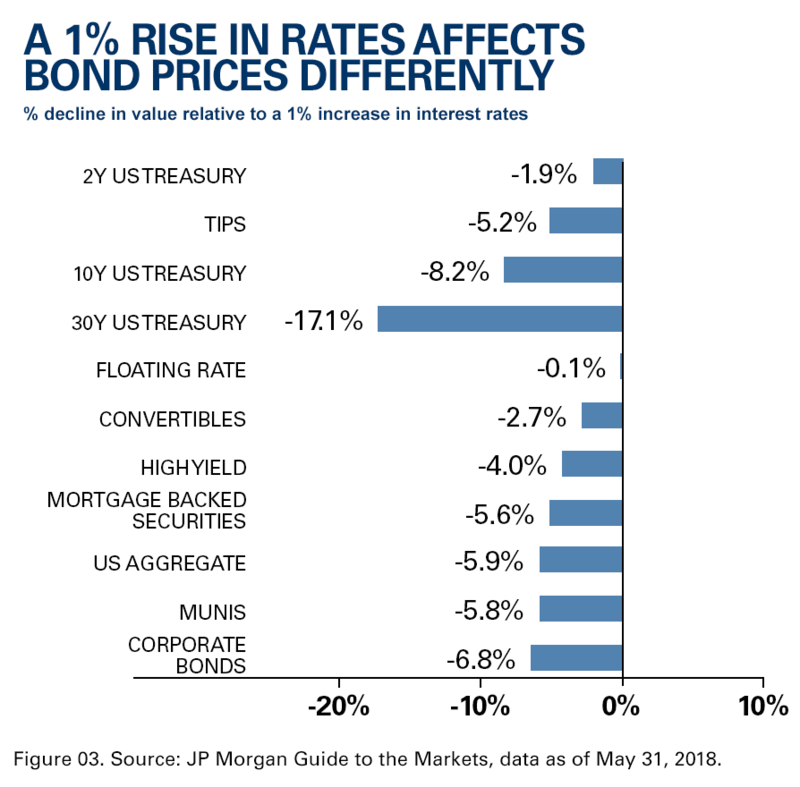 Over the previous four rate-hike periods, listed above, high yields (low quality) performed better than most bonds and generated a positive total return. Excluding the 2000 technology bubble, high yields appear to be very effective by avoiding the long-term bond risk that typically would affect 30-year Treasurys. Therefore, we would predict in the current rising-rate environment that high yields could perform quite well compared to other bond asset classes. They may even have a significantly positive return. We should be careful in drawing conclusions regarding corporate bonds only from the short rate-hike periods. Corporate bonds (high-quality, long-term) react similarly to long-term government Treasurys with a change in rates. It’s more important to analyze long-term trends and other short-term, economic, and credit issues that can affect bonds when considering corporate-bond behavior. Looking at the past 60 years of the corporate bond market, we can clearly divide it into two periods: a long-term, rising-rate era (1958–1981) and a long-term, declining-rate era (1981–2016). During the era of rising rates, corporate bonds returned 3% during 5% inflation for a real rate of return of -2%. Traditional bonds did not perform well over that 23-year period.2 Post-1981 through 2015, in the era of declining rates, corporate bonds created a positive real return of 6.6% (9.6% with 3% average inflation). Given the large increase in bond values of over the last 30 years, it’s wise to assume that the average rate of return for corporate bonds is not likely to continue into the future. More importantly, the interest-rate sensitivity of core fixed income has increased steadily since 2010 and is now near all-time highs,3 making them even more undesirable in a rising-rate environment. What is the impact of rising rates on equities? Historical rising-rate periods can teach us how the market has performed. 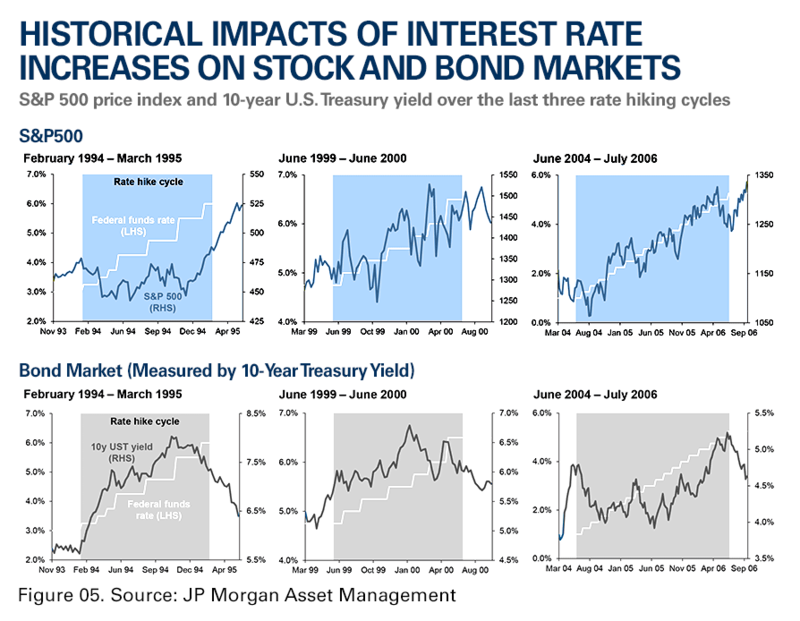 During three rate-hike periods in recent history, the S&P 500 reacted initially with volatility, but then rebounded during the cycle to end with growth, some even significant (top three graphs below, blue section represents equity reaction during rate hike). During these periods, it’s likely that the economy continued to accelerate, and the rate increases served to avoid any inflation bubbles anticipated by the Fed. The stock market should perform well in periods of economic expansion and rising rates are expected to accompany expansion. Economic growth allows companies to raise prices—a form of inflation. Increased prices then can lead to increased earnings which support increasing stock prices. Typically, rising rates indirectly affect the stock market through their direct impact on the economy. Any equity allocation in a rising-rate environment should be based upon the forecasted economic cycle and the underlying performance of companies in a portfolio, not directly upon interest rates. Today, although stock prices are high, the Fed's rate increases are a good indicator that a looming recession and stock-market correction are not part of their forecast. For many investors, it's critical to now proactively review your bond portfolio. We're in a rising-rate environment that is highly likely here to stay, and as stated herein, that makes certain types of bonds riskier than they ever have been in our lifetime. Pulling out of bonds altogether is not a prudent choice; instead, there is a way to manage bond risk. Proactively reallocating to a mix of bond asset classes that 1) continue to generate income 2) respond differently to rising rates, and 3) reduce your overall risk profile is the next step. Owning a combination of short-term bonds and those bonds that historically perform well with rising rates should provide a better risk-adjusted total return in a portfolio that does not want to invest entirely in stocks or lose money to inflation with cash. A rising-rate environment may bring on short-term volatility, but history tells us that equities are not directly affected by rising rates longterm. Instead, rising rates point to continued economic growth, which supports potential equity growth. We continue to view U.S. equities favorably in a rising-rate environment. If you’d like to explore ways to reduce portfolio risk, let’s chat. 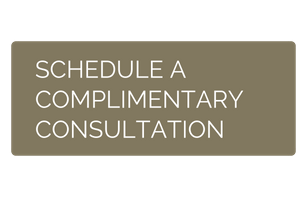 We’re pleased to offer a complimentary investment management consultation, either over the phone or in person. Read Part 1: Reducing Investment Risk: How Your Emotions Can Increase Risk. 1 J.P. Morgan Strategic Income Opportunity Fund outline, 8/31/2015. 2 J.P. Morgan Guide to the Markets, September 30, 2015, page 31. The opinions voiced in this material are for general information only and are not intended to provide specific advice or recommendations for any individual. All performance referenced is historical and is no guarantee of future results. All indices are unmanaged and may not be invested into directly. No strategy assures success or protects against loss. Stock investing involves risk, including loss of principal.